Today's guest poster is Carol of She Lives, one of the first blog friends I ever met in real life. Carol has–not once, but twice–walked with a parent through the extraordinary difficulty of Alzheimer's disease, and I asked her if she'd share with us some of what she has learned. It it is cruel that you have to suffer this twice. My dad died of it. He was big and strong and loved by everyone and it still took away who he was. Keep getting the message out it will make a difference. Watching my grandfather go through it was horrible. Such a strong man of faith that turned into a tantrum filled toddler along with many medical problems. The adopt a caregiver is soooo important! My grandmother kept him at home as long as she possibly could and the folks at her church who helped her out were the best to her! (she lives at least 3 hours from family) They did the littlest things, but it always meant the world to her. How heartbreaking… but you’re right, it’s important to be educated so thank you for sharing your story with us. Thank you for sharing this. My husband’s grandfather passed away from Alzheimer’s 5 years ago. Now, my husband’s grandmother on the other side has it. She’s had it for many years and has been on some medications to slow the progress, like you mentioned. It’s heartbreaking to see her try to struggle to remember things and feeling foolish when she can’t. I’m so sorry to hear about your parents. I will definitely be watching for the Alzheimer’s walk in our area this year. Both my maternal and paternal grandmothers have had Alzheimers, one when I was a teenager and the second now that I’m in my 30’s. I’m a little better equipped to deal with it now, especially after having toddlers of my own, but it’s so hard to watch the ones who used to be your rock needing constant help. Carol, thanks for an eye-opening, sobering, and very informative post that is spurring me to action. I’m going to find some “purple” to put on my blog ASAP! My dad died of liver disease, which affected him mentally for the last couple of years of his life, so I can relate a tiny bit. Also, my husband’s stepmom died with Alzheimer’s. My heart truly goes out to you and your family. Ny grandmother passed away 14 years ago. We lived over 1000 miles away, so my mother was unable to help her sister care for their mother. I think, for my mom, the guilt of not being there was one of the hardest things. Praying for all who must walk this road. Thanks for sharing that with us. I’m sorry for your losses. This is s superb post….thank you. The single most important thing to do is to arrange durable/enduring powers of attorney, because with out them, the nightmare becomes horrendous. Why wait? Do them now. And for yourself too. My Dad died of a very rapid form of Alzheimers 8 years ago, (Lewey Body Disease) and I know only too well what a toll it takes on families and carers. The list of how to help is so spot on, it almost makes me want to cry, when I think back to those days. Incredibly isolating days, because Alzheimers sufferers can also be very unpredictable. My Dad used to wander off …”run away”. Oh heavens….I remember it so well. I have a book “All your health questions answered naturally” by Maureen Kennedy Salaman. In it, she tells of a man named Tom Warren who took drastic measures when he was diagnosed with Alzheimer’s – had teeth with fillings pulled, completely changed his diet and supplements, etc. He wrote a book called “Beating Alzheimer’s” after it was determined that the disease was reversed. Maybe it could help someone else out there. 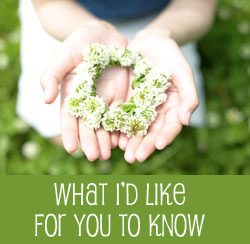 I think “What I’d Like For You to Know” is so helpful. I wanted to recommend someone that you might want to feature. Her name is Shelly Buck. Her husband was in a diving accident, and is now a quadraplegic. A year before her husband’s accident she lost a young daughter in an accident at their home. She is a Christain woman who is very open about this journey and all its ups and downs. She might be willing to share with your readers as well. You can read her story on their blog at http://www.joshbuck.org. You could have been describing our journey with ALS, except there is no mental degeneration. You and your family are in my prayers. The first thing I did when my mom was diagnosed was to educate myself on Alzheimers. I spent many hours resarching it online and going to the library reading books. My dad is a full time caregiver and I see the toll it is taking on him. I try and spend at least 2 days a week at their home to try and give him a break. I live about an hour from my parents. It is so hard to try and get people to support this cause or even care about it unless they are or have been effected by it in some form or another! Thanks for sharing your story. Devastating IS the word. Watching my Aunt Frances go through her Alzheimer’s struggle for 10 years was cruel. It robbed her of everything she ever was, and everything she had. I hope I never have to see another family member walk that road. Thank you for posting this. I had no idea how horrendous this disease was until my upbeat and lively grandma was diagnosed. The grandma I knew is aready gone though she is still alive. It has been hard watching the changes in her and how hard it is on my grandpa. Educate and support. Boy, I couldn’t have said it any better. 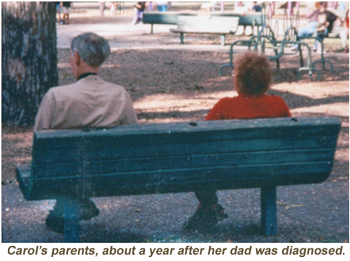 When my incredible grandmother was diagnosed with Alzheimer’s, it was heartbreaking. Here was a woman that had given her life to care for those in need. She was a nurse in the army during WWII (where she met my grandfather- hysterical story there) and then in a hospital once she got out of the army. She was smart, funny, loving, compassionate, willing to lend anyone a hand, and never met a stranger. Alzheimer’s took all of that from her, from us. I was her daytime caregiver during all of that. I would show up at my Mom’s house at 7am and wouldn’t leave until at least 6pm. My Mom would come home from work and take the night shift. I would go home, eat, sleep, cry, regroup, and come back the next day. It is time I will cherish forever with her. She cared for me as a child and I was able to care for her in her last days. But the strain, the pain, the emotional turmoil, the hurt, the anger, the struggle that came with it was isolating and hard. To have a woman you love so much tell you she hates you, hit you, kick you, or throw something at you when you know she would be moritified to see herself doing that if she were able to step out of that state was horrific. But love prevails and you do what she needs, duck, do what she needs, dodge, do what she needs, return the “I hate you” with “I love you” and you get through it, day-by-day. Thank you for sharing this. My much loved mother died of the complications of Alzheimer’s on 1/15/05. I cannot imagine going through it twice. Be nice to your children and create a living trust and will so everything is in place before something like this happens. My parents did and it made the legal/financial part easy to navigate. The emotional cost was not easy at all. This feature is the reason I read your blog, Shannon. Glad it’s back. You are doing Kingdom work. Carol, thanks for sharing your story with us. Thank you for sharing your story. I’m so sorry to hear about losing both your parents this way. My husband’s grandma had Alzheimer’s, and it was heartbreaking for us to see. Shannon, Thank you for allowing me this opportunity to share with your readers. They’ve touched my heart in ways I cannot express. I am honored to hear their stories and share in their experiences. To all of you who have commented, thank you. I am deeply moved and heartbroken for all of you. Although our individual experiences differ from person to person, collectively we all share the pain unique to Alzheimer’s/dementia. I am blessed and grateful to all of you. This is such a powerful post. I love how Carol shares how to get involved. My grandmother passed away from Alzhemiers. She lived until she was 89. Even so, it was so hard to see her go to the “infant stage” of the disease and then watch it take her life. Thank you, Carol, for sharing your experiences and for sharing all of the wonderful resources. (Here’s a short tribute I wrote to my Grandmother after she passed away: “I love you, too, Honey”) Now, I am off to splash some purple on my blog! Thank you for this post. I have watched my grandmother decline of Alzheimer’s for the last 12 years. She is now bed bound, non-communicative, in a nursing home. It was a horrible, difficult journey (she lived with each of us for a while). She became psychotic, paranoid, aggressive. In her pre-Alzheimer’s life she was the kindest, gentle 5 foot tall woman you could ever meet. She does not seem to be in any pain and she can still chew and swallow her food. She weighs about 92 pounds. Very sad. My grandfather has vascular dementia. It’s not Alzheimer’s but equally painful to watch this man who was once a strong farmer; now wear adult diapers, does not know the names of his children, grandchildren, or great grandchildren, and he shows a flat expression day after day. After my mother and aunt cared for him in their homes for the last 4 years, he is now in an alzheimer’s unit at a local assisted living facility. I give to the Alzheimer’s Association annually and I have walked the Walk several years. Thank you for helping this cause. I pray for a cure. My dad was diagnosed with Alzheimers earlier this year after being told just a month before that he didn’t have it. We think it may be hereditary in our family as my grandmother suffered from some kind of dementia as well. Thanks for this informative post. I will be linking to it in the near future. The best book I have read on this subject is Journey Into Darkness, by Ron Simpson Jr.
Gleaning wisdom from those who have walked the road before you can prevent earning some of the blisters yourself. My dad died of Alzheimer’s and now my mother is showing symptoms. I really don’t know if I am strong enough to endure going through this again. What a great idea for a weekly post! I’ve heard of your blog here and there and am happy I finally stopped in. I’ll be back! Awesome Awesome post! So helpful. i really enjoy these posts! they remind me of my need to be more sensitive and i love the education they provide. I’ve lost a loved one who suffered from dimentia near the end of her life. They leave before they are really gone. The picture says it all. Thank you for sharing your story. I hope people will reach out to the caretakers they know are caring for someone. Wow! Great post. As a professional who works with families and seniors affected by this disease I applaud you. My grandmother died of this. Horrible, excruciating to watch. Awful. I was a child, and then a teenager–a selfish, vain teenager–when she was going through this. I couldn’t handle it. I didn’t know how. I was her favorite, and I didn’t act like it when the disease progressed. I will never forgive myself, I’m afraid, and I will never forget what that was like. I fear terribly this happening to me. I cannot believe you have lived through this twice. My name is Mary Louise and I have been writing about losing my sister to Alzheimers since she was in her late 40’s. We were as close as twins and I don’t know how I could have gotten through this time without writing my thoughts down. Peggy was active, beautiful, intelligent and caring. Please go to my site when you have time. I am sorry about your Dad and Mom but I have learned over the years that it hurts us much more than it hurts them. I find some comfort in that!!! My beloved, wonderful grandmother was diagnosed with Alzheimer’s 2.5 years ago. She did well on medication, but this autumn, the cracks started to show. On Christmas Eve. of this year, she fell on the basement stairs and passed away. I know she is with her Lord and that’s where she wanted to be. Even though I miss her daily, I thank God that she will not have to suffer the horrific indignity of end stage Alzheimer’s. Every now and then, like last night, I dream that she is still alive and not only does not recognize me, but rants and raves at me. Even though I know it’s just a dream, I often break down when I awaken because I know that for so many people, my dream is a daily reality. I pray every day for God to strengthen all families who must walk this path and that He might freely give them peace, grace, and understanding. This post really moved me. My grandmother had this terrible disease, and it was hard to watch. I was a teenager at the time, and I really didn’t handle it as well as I would have liked. She didn’t know who I was, or my Dad (her son), nor did she remember her husband at all. But, she did know that I and my Dad were someone special, and she would light up when she saw us. That is the only thing I cling to. I would be interested in learning more about resources for family members, especially children and teens dealing with loved ones with the disease, because Alzheimers is an especially difficult disease for these age groups to deal with. Thank you for sharing this information with your readers. My grandmother died in her late 70s of Alzheimers. My mother has been showing symptoms for a couple of years, and she is not 60 yet. This summer she was diagnosed with Alzheimers, but another doctor thinks it could be something different. As a couple of your commenters pointed out, there are many forms and manifestations of dementia. I appreciate your willingness to draw attention to this terrible disease. Thank you, Carol, for this post. I had already adopted this “cause” and will be walking this year, but reading this has given me even more passion to do whatever I can. You see, we have a lot of dementia in my family. Although not Alz. it’s still a terrible thing. And I can only imagine how much harder it’s on family, friends and the person going through it when it’s ALZ. I think there is nothing more sad and evil than an illness ROBBING you of a lifetime of memories and robbing the family and friends too.